. Tags: inspiration, Jim Blasingame, motivation, Small Business, small business advice, small business success. Over the past several years, a lot of people have had their hands out for help from the government; from GM, Chrysler, and AIG, to all of the big banks. Then there are the unions that rely on government defense for their very existence. Big corporations make billions of profits doing business with the government. And the number of Americans accepting financial welfare-type support from the government is at an all-time high. 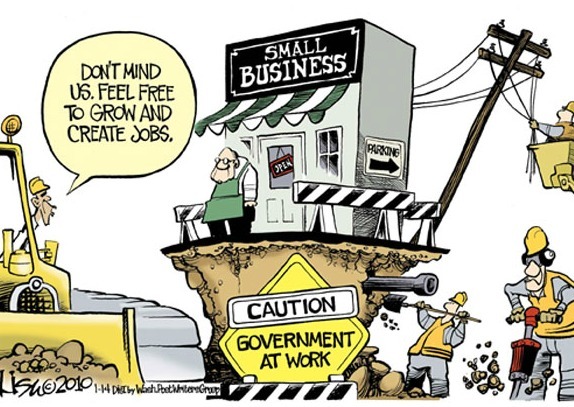 A whopping 2% said, “The government is very supportive of small business.” And less than one-in-ten said, “The government should do more to help small business.” But those small business owners who believe the government should just “Get out of our way” came in at 89%. What if every sector of America-and I’m not talking about the truly poor who really need our help-felt the same way small business owners do? I would like to see what that looks like, wouldn’t you? Thanks for being part of my community. I’ll see you on the radio and the Internet.